There are over 300 species of Squid found around the world. 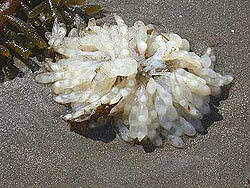 They live in all marine habitats, from shallow waters to the ocean depths. Squid fcan be grouped into two categories – the Myopsida group which live in the shallow waters and have suckers on their tentacles.The Oegopsida group live in deeper water regions and have hooks on the ends of their tentacles. 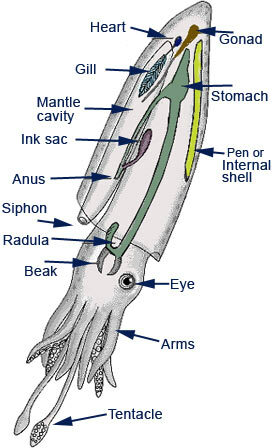 Most squid have eight arms arranged in pairs and two longer feeding tentacles. They are soft-bodied and also have bilateral symmetry, a distinct head with a large brain and eyes, and a fin, used to help in swimming, on each side of the body. The giant squid can grow to 13 metres in length and weigh over 450 kg, however most squid are less than 60 centimetres long. Squid are fast-moving carnivores. They eat fish, crustaceans and other squid catching their prey with their two feeding tentacles, then hold the prey with their arms and bite it into small pieces using their parrot-like beak. The main predators of squid are birds, sharks, tuna and other larger fish, toothed whales, some crabs, squid, and humans. Vampyroteuthis "vampire squid from hell"
The partly transparent skin is covered in chromatophores which allow the squid to change color to suit its surroundings. The underside is also almost always lighter than the topside, to provide camouflage from both predators and prey. The siphon is used for jet propulsion. Water is sucked into the mantle cavity and forced out of the siphon in a fast, strong jet. The angle the siphon points can be varied to change the direction the direction the squid moves. 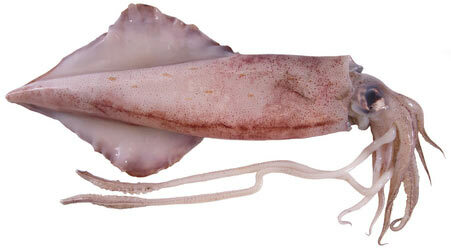 Most squid have a life span of one to two years with Giant squid living from three to five years. They normally die soon after mating. Squis usually spawn in groups. The males store packets of sperm in specialized, long arms, which pass through the female’s mantle during mating session . Most squid lay their eggs on the sea bed, some squid carry a clutch of eggs to guard them. although their tentacles are shorter.